17 months ago today was the happiest day of my life. I gave birth to the most beautiful baby boy. Our hearts were filled with happiness. I have a video that Scott took of us in the hospital. I was holding Noah and talking to him...I told him he was stuck with us forever. At that moment I was prepared to take care of Noah for the rest of his life. I wasn't prepared for only 11 months. I wish so badly I got more time. I wish so badly he was here today. I don't know what 17 months looks like. I can't imagine what he'd be doing or what he'd look like. It's been almost 6 months that he's been gone and he seems so far away. I remember him, everything about him, his smiles, his facial expressions, his infectious laugh, our memories, everything. But I am forgetting what it's like to mother him. To have to make bottles, change diapers, pack a diaper bag, eat out for early dinners because he had to be home and in bed at 8pm or he'd start getting crabby. I forget what it's like to not sleep as much, to always be planning for the next phase of his life and the things we need to buy/learn to accommodate that. It kills me that those things were once second nature and I now am forgetting what that was like. Because now it is just Scott and I. We can sleep when we want, come and go as we please, do whatever we want. When we had Noah I missed those things at times. I obviously would never have traded him to have those things back, but you naturally want to sleep more, have more time, date nights, etc. But life without children is boring. It has no purpose (to me anyways). Children give you the greatest gift - they love you unconditionally, they need you, rely on you, trust in you. And I've never felt more successful, more loved, or happier in my life than the 11 months we had Noah. We are very fortunate to have friends and family who are continually supporting us. However other SIDS moms warned me that things get harder around this time because peoples lives have moved on. And I absolutely understand that. They should move on. They are not faced with this tragedy that we are. They don't live it every single day. We can't expect people to "live" with us for weeks like everyone did those first few weeks. Our friends have their children and they are loving life and watching them grow. Their lives revolve around them as they should. But meanwhile we are lost and feel so alone. We are stuck between being parents and not being parents. Our relationships with people have changed because we have changed. I hate everything that has changed. I've never been one to embrace change so that makes this even harder. We will still fight as hard as we can to survive because that is what Noah would want. I will still live my life the way he'd want me to so that he can be proud of his mama. With that, we love doing everything we can to honor him. 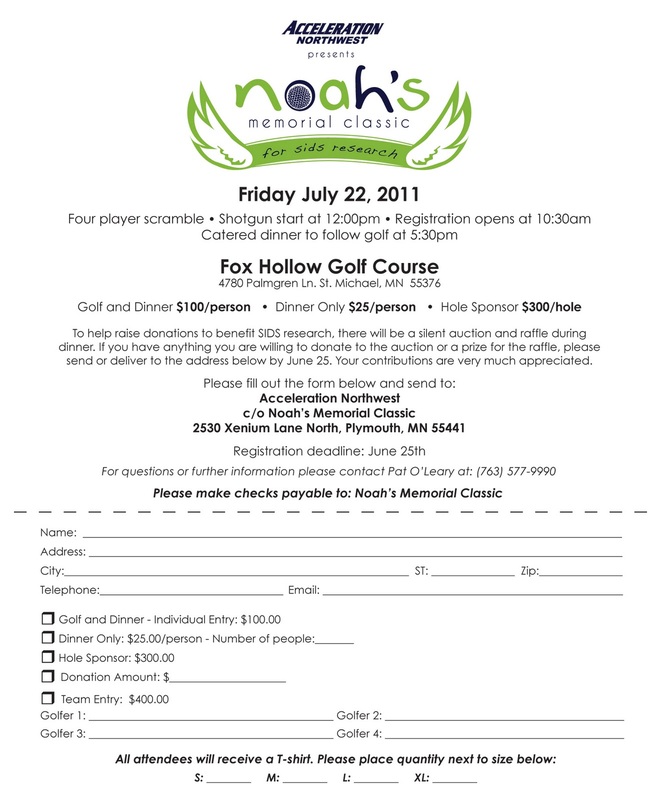 I'm sure most of you have heard but we are throwing a golf tournament on July 22nd at Fox Hollow Golf Course in St. Michael to honor Noah and raise money for SIDS research. All proceeds with go to the CJ Foundation for SIDS and the SIDS Institute. I have attached the registration form. If you are interested in golfing, attending the dinner/silent auction, sponsoring a hole, or sending a donation, please see the information on this registration form. If you would like to donate a prize or item for the silent auction, we would greatly appreciate it! We have already started receiving some amazing donations and prizes and are so very thankful for everyones support. We are really excited about getting everyone together for this event to honor our beautiful boy and raise awareness and money for SIDS research. I'm not sure they'll ever find a cause or a cure in my lifetime, but I have to know that we are doing everything we can so that hopefully one day parents will not have to live their life without their child. Happy 17 months sweet peanut. I'm missing you every second of everyday. Everything I see, everything I do, every moment I live reminds me of you. Please send me a rainbow soon! I need to know you're with us all the time. I love you so much. ditto. ditto. ditto. sometimes i feel like i am making headway but then all of a sudden i feel like i don't even believe that ellie is gone. i hope you find peace in doing something in noah's honor. i agree with tiffany, he must be so proud of you! my husband grew up about a mile away from fox hollow and worked there all through high school. i was really excited when i saw where you were having the tournament because i thought we could come but i am in a wedding the next day and have groom's dinner and rehearsal that day :( i'll be thinking about you guys that day! 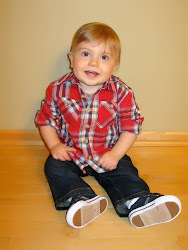 Found your blog on another SIDS mommy's blog...anyways, so sorry for your loss, your son was so beautiful!